January is National Soup Month and a reminder that winter is the perfect time for delicious soups to warm the body and soothe the soul. Many nutritious soups are available from local grocers and specialty groups such as our friends at Soup Box Love. The Healthy Meals Resource System of the USDA is featuring many soups this month, as part of their effort to promote healthy meals. Did you know there are many delicious Native American soups like green chili stew, dried corn soup and dry meat soup? Or that soups were part of the ancestral diets of indigenous peoples inhabiting North America? Lois Ellen Frank, Ph.D., is a Native American Chef and Owner of Red Mesa Cuisine. In the PBS segment on the Native American Food Movement that is now airing (check your local listings), Chef Frank reminds us that traditional Native American foods are nutritious and delicious, and that a return to an ancestral, plant-based diet is a way to reclaim health and wellness in Native communities. Chef Frank is from the Kiowa Nation on her mother’s side, and has spent the past 25 years documenting the way of life and food habits of Native American tribes. She immersed herself in Native American communities, allowing her to accumulate traditional and contemporary recipes that speak to the simple ingredients Native Americans had access to from the beginning. Heat the cast iron or soup pot over medium-high heat. Add onions, sauté for 2 minutes until translucent, then add green bell peppers and sauté another 2 to minutes. Cut each of the whole tomatoes from the can into 8 pieces (a large dice) and add them to the onions and green bell peppers. Cook for another 2 minutes, stirring constantly. Add the zucchini squash and sauté for another several minutes, stirring constantly to prevent burning. Add the beans and the cooked corn and stir well. Bring the chile beans to a boil, and then reduce heat to low. Stir in the dried red chile powder and salt. Let simmer for 20 minutes, stirring occasionally to prevent burning. Serve hot with No fry bread, or homemade corn or flour tortillas. PWNA is pleased to collaborate with Chef Frank and other Native food experts, to support gardening and training on healthy cooking and eating in Native communities, and to support the national effort to promote healthy meals during National Soup Month. 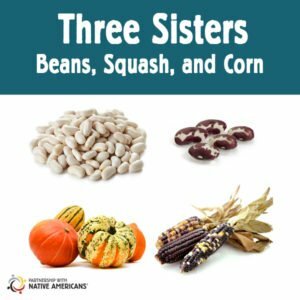 This entry was posted in Humanitarian, Programs and tagged Ancestral diet, healthy nutrition, National Soup Month, Native American, Native American Food Movement, three sisters. Bookmark the permalink. Trackbacks are closed, but you can post a comment.